iWinDirect | Your Source for the best VALUED supplements! At iWinDirect, we believe it is essential to purchase direct from the manufacturer in order for you to obtain the very best value for your supplements - we call it the "Best Value Model." There are no middle men, which means that you get to benefit from immediate savings on all of your supplement requirements. Our monthly sales, Facebook deals and special mail-out offers take the savings even further. Of course, just as important as price is the assurance that the product you are taking is of the utmost quality. All iWinDirect.com products are tested extensively and produced according to strict criteria that either meet or exceed all industry standards and Good Manufacturing Practices (GMPs). We are able to control the quality, integrity, packaging and storage conditions on all of our products from raw material status until the product leaves our door. Who says you need to pay more for great quality? 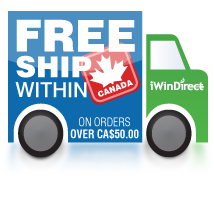 To pass on even greater value to you, we are pleased to offer FREE SHIPPING on orders over $50 [within Canada]! How much is your time worth? Well for most of us, the thought of getting in the car and driving down to the local store is no longer as appealing, especially considering the cost of fuel. Take advantage of our offer and have your favourite products shipped directly to your home or address of choice. If that’s not enough, you can be assured that your satisfaction with our products is 100% guaranteed. That’s right: you get the advanced promise that if you are unhappy with your purchase, we will refund your money. For more information on our guarantee, click here. Put this all together and iWinDirect.com is your spot for the best quality supplements at the lowest prices. Buy Direct and Save! If you do not see a product for sale that you would like to purchase, please let us know in the "Contact Us" section and we will let you know if it will soon be available. We've taken the same taste as Canada’s best-selling Iced Cappuccino and replaced the added sugar with whey protein and soluble inulin fibre. Iced Cappuccino DynaWhey provides an equivalent level of caffeine as one cup of coffee. Pure Unflavoured DynaWHEY mixes instantly and contains no added sugars, sweeteners, flavors or colors. It is perfect for anyone looking to add a flexible, high quality protein source to his or her diet. DynaMIGHT, from the makers of DynaWhey, improves performance in repetitive bouts of brief, highly intense physical activity.